Wiredex can provide the highest levels of flexibility, functionality and cost effectiveness in supermarket shelving. 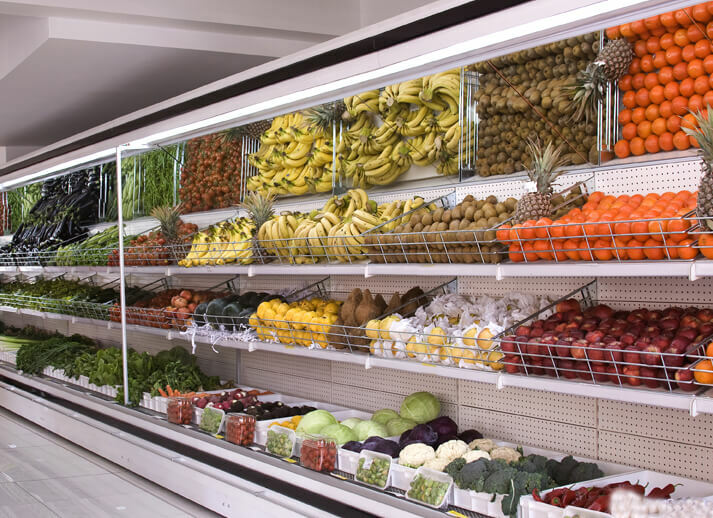 Our tailor-made merchandise display systems are uniquely adaptable and well suited for use in all supermarkets, liquor stores, cool rooms, produce stores, hardware stores and more. Wiredex supermarket shelving can be fully repurposed for a wide range of products, with a complete choice of different shelf levels and independently modular locking beams that can be removed, relocated or otherwise adjusted without disturbing other shelves. Available with both single and double sided access, suitable for all store layouts and space constraints. Data strips and attachments available, for both digital and visual reading of product information. Optional pegboard, shelf, hook or combination fixtures included. The Wiredex guarantee means you know you’re getting a superior product with a full range of advanced functionality, at market price or even lower. This is because we manufacture everything ourselves. When you shop with us, you’re cutting costs by going right to the source. We take full advantage of the advanced edge metalworking facilities at our disposal with every production run, and can incorporate a wide variety of materials, finishes and treatment procedures. This lets us offer supermarket shelving features that no one else can. Our products are available in materials ranging from melamine to steel to wire mesh. This lets you choose an exact blend of strength, weight, flexibility, logistical convenience and aesthetic considerations to perfectly suit your business. Just tell us your requirements, and we can recommend the best materials. Every supermarket shelf needs accessories in order to maximise value and sales potential. Getting the right ones can provide advantages across the board, while mismatching or improperly fitted accessories can undermine supermarket shelving functionality and sales potential. With Wiredex, you’ll never have to worry about that. We can make any add-ons you’ll ever need, with matching materials and finishes that properly accentuate the shelving system’s natural characteristics. Our manufacturing capabilities make us the best shopfitting supplier in Melbourne. Like you, we’re focused on stand-out customer service. Providing exceptionally high quality shelving solutions at a great price is only part of what we do. We also offer ongoing support in order to accommodate any future requirements for accessories, special sales events, new product lines or the need for new levels of functionality. For the best supermarket shelving systems, contact us today.